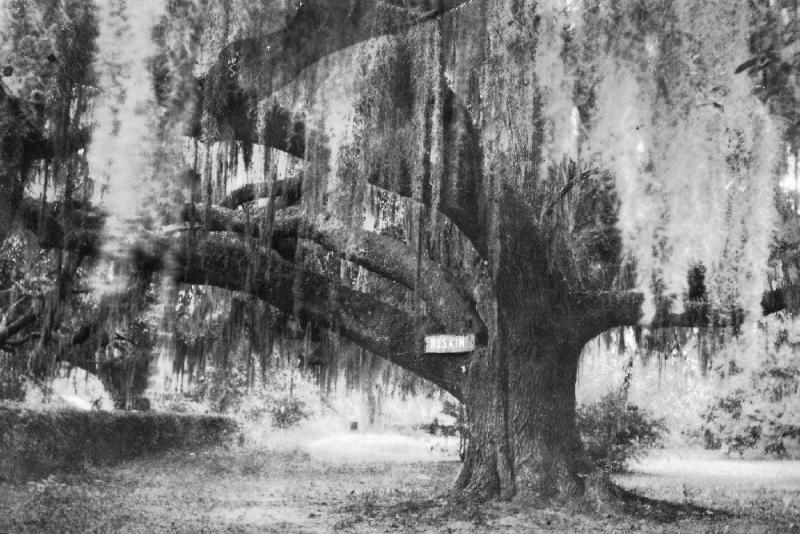 This vintage image probably made in the 1930s depicts the “Ruskin Oak”, a live oak tree, located in Lot 12 of the Ruskin Oak Subdivision on the west side of Ruskin Avenue. This unfortunate tree was the object of a cruel hoax perpert rated in the distant past. Local lore relates that John Ruskin (1819-1900), an Englishman who was a poet, author, and artist and a 19th Century icon highly recognized as art critic and social critic, had tea under this tree in 1885. Not! The Harden family relocated to Russell’s Point, Logan County, Ohio. The Ruskin Oak is a live oak tree, Quercus virginiana. Live oak is a large spreading tree of the lower Coastal Plain from southeastern Virginia to southern Florida and to southern Texas. It normally grows in low sandy soils near the Coast but also occurs in moist rich woods and along stream banks. On the Gulf Coast, live oaks often support many types of epiphytic plants, including Spanish moss which hangs in weeping garlands, giving the trees a striking appearance. Live oak is a fast-growing, hardwood tree. Sweet edible acorns are usually produced in great abundance and are of value to many birds and mammals. The yellowish-brown wood is hard, heavy, tough, strong, and is used for structural beams, shipbuilding, posts, and in places requiring strength and durability. The trees have been historically planted in cities. When planting live oak, it should be restricted to large yards or parks where the spreading form can be accommodated. John Ruskin (1819-1900) was born in London, England. His father was a wealthy wine merchant. Ruskin was educated at the University of Oxford, where he was awarded a prize for poetry, his earliest interest. It was there that he met Joseph Mallord William Turner, whom he began to defend against critics in an 1836 essay. His ‘’Modern Painters’’ series was responsible for the early popularity of the artist as well as the pre-Raphaelite movement. Ruskin spent much of his later life at a house called Brantwood, on the shores of Coniston Water located in the Lake District of England. Ruskin taught first at the Working Men’s College in London. He was the first Slade Professor of Art at Oxford University, from 1869 to 1879. There John Ruskin friendly with Lewis Carroll (1832-1898), the author of Alice’s Adventures in Wonderland and was photographed by him. Ruskin College at Oxford is named after him. Upon the death of his father, Ruskin declared that it was not possible to be a rich socialist and gave away most of his inheritance. He founded the charity known as the Guild of St George in the 1870s and endowed it with large sums of money as well as a remarkable collection of art. He also gave the money to enable Octavia Hill to begin her practical campaign of housing reform. Ruskin’s later works influenced many Labor union leaders of the Victorian era. He was also the inspiration for the Arts and Crafts Movement, the founding of the National Trust for Places of Historic Interest or Natural Beauty, the National Art Collections Fund and the Society for the Protection of Ancient Buildings. John Ruskin wrote over 250 works, which tended to connect art history to topics ranging from science, literary criticism, environmental conditions, and mythology. He is well known for his essay on economy ‘’Unto This Last’’, the essay ‘’The Nature of Gothic’’, and the early fantasy novel ‘’The King of the Golden River. In 1983, the Ocean Springs Junior High School 8th Grade enrichment class supervised by Deanne Stephens Nuwer collected anecdotal histories of many local homes and landmarks. The Ruskin Oak was the object of one researcher. The following is the results of his study of the fabled tree. The old oak tree, which is located on Ruskin Avenue, is named for John Ruskin, the famous art critic and social reformer. John Ruskin is said to have written Mahatma Gandhi’s favorite book. John B. Arnold, the president of the Cotton Exchange built the house beside the oak for his wife’s summer cottage because he loved her so much. John Ruskin had been at the Cotton Exposition in New Orleans, so he visited his friends, the Arnolds, in Ocean Springs. During his visit, he attended a tea party under this tree in 1885. The circumference of the tree is twenty feet and six inches. Its branch spread is more than 150 feet. This tree is a magnificent example of the beauty of Ocean Springs. The World's Industrial and Cotton Centennial Exposition celebrated the 100th anniversary of the production, manufacture, and commerce of cotton. It was held in New Orleans from December 16, 1884 until it ended May 31, 1885. The idea for the fair was first advanced by the Cotton Planters Association, and the name World Cotton Centennial referred to the earliest surviving record of export of a shipment of cotton the United States to England in 1784. The planning and construction of the fair was marked by corruption and scandals, and Fair Director Edward A. Burke absconded to Brazil with over one and a half million dollars of the Fair treasury. Despite such serious financial difficulties, the Fair succeeded in offering many attractions to visitors. It covered 249 acres, stretching from St. Charles Avenue to the Mississippi River, and was notable that it could be entered directly by railway, steamboat, or ocean-going ship. The main building enclosed 33 acres, and was the largest roofed structure constructed up to that time. It was illuminated with 5,000 electric lights, which was still a novelty at the time, and said to be 10 times the number of electric lights then existing in New Orleans. There was also a large USA Government & State Exhibits Hall, a Horticultural Hall, an observation tower with electric elevators, and working examples of multiple designs of experimental electric street-cars. The Mexican exhibit was particularly lavish and popular, constructed at a cost of $200,000 dollars, and featuring a huge brass band that was a great hit locally. In an unsuccessful attempt to recover some of the financial losses from the Fair, the grounds and structures were reused for the North Central & South American Exposition from November 1885 to March 1886 with no great success. After this the structures were publicly auctioned off, most going only for their worth in scrap. The site is today Audubon Park and Audubon Zoo in Uptown New Orleans. Besides the “Ruskin Hoak tree”, The World’s Industrial and Cotton Centennial Exposition (1884-1885) gave Ocean Springs Parker Earle (1831-1917) and Miss-La-Bama. As related many times in this column, Parker Earle was the Horticultural Director of the Cotton Centennial at New Orleans. The Earle family was obviously impressed with coastal Mississippi for in July 1884, Charles T. Earle (1861-1901), Parker’s son, purchased twenty-five acres known as the Stuart Orange Grove from Elizabeth McCauley (1840-1925) and W.R. Stuart (1820-1894). This property was located on the Fort Point Peninsula, now generally known as Lovers Lane. During his short stay in Jackson County, Parker Earle founded what became the large, Rose-Money farm in the Old Fort Bayou community, now referred to as St. Martin. When the Cotton Centennial Exposition closed at New Orleans, William B. Schmidt (1823-1901), a wealthy wholesale grocer domiciled in the Crescent City, purchased the "Alabama Cottage." Schmidt had it barged down the Mississippi River and erected on his estate. The small structure was used by the children of the Schmidt family for plays and as a music studio. Appropriately, the Wulff sisters, Vera Wulff Cook (1906-1992) and Bernadine Wulff (1899-1992), who made names for themselves as chanteuses in the theaters and radio at New York and Chicago, owned the house from 1944 until 1971. Miss Bernadine Wulff called her home "Miss-La-Bama" because it had connections with all three states. Jan G. Walker has owned the old Schmidt music hall since December 1999. It has undergone many additions and alterations since it arrived here from New Orleans. Architect Bruce Tolar did a large addition for John J. “Jerry” Weigel (b. 1932) in 1990-1991. The real Ruskin Oak legend? Once upon a time, long ago, a young southern boy chose this tree for hidden moments with Ruskin, the English poet. He had a book of the author’s poems but because it was considered sissy by his more robust brothers, he kept his poetry moments to himself. Then came the War Between the States. The quite southern boy didn’t want to fight so he hid out in the swamplands, coming in only at dark –to the big oak to meet with his sweetheart. One evening his book of Ruskin’s poems slipped from his pocket and was found the next day by one of his brothers. Since his name was inscribed on its flyleaf, a trap was set and the next time he returned to the tree he was captured and forced into service with the Confederate Army. As the war became more bitter, the carpetbagger took his family back to the North and it looked like the romance of the Ruskin Oak would die with the tree. Bit when the war was over, the boy’s regiment found itself at liberty in a State not to far from his Yankee sweetheart’s original home. He worked his way to her town. With fearlessness he spoke, for what he knew, he knew! Time marked his foot prints everywhere he walked. This tree to him was God’s own masterpiece! Each twig and leaf some ancient scripture told. Of secrets old as all the Earth is old. This living oak has honored him. Born many times, departed from this incarnation October 1, 1968. Her ashes mingle with the elements and sweet memories and happy hours shared with her dear ones in this garden and forevermore shall be a part of it. John M. Alford, a retired physician and long time resident of Ocean Springs, has written a poem about the Oak tree. I find his work an appropriate way to conclude the chronology of the Ruskin Oak. On tide for life’s flotsam. Face a sea destined to reclaim it. That glorify for Glory’s sake. To succor at stygian depths—fallen warrior. A poet might say: “Perceive the Oak in its majesty. But no more. I have grown in grace since Eden. Male and female am I, creation’s gift to begin. Mississippi Gulf Coast Yesterday & Today (1699-1939), Federal Writers Project in Mississippi Works Progress Administration, (Gulfport Printing Company: Gulfport-1939). Ocean Springs, Mississippi: A Look at the Beautiful Past of a Beautiful City, (Ocean Springs Junior High School 8th Grade Enrichment Class-1983, Deanne Nuwer, Editor), 76 pages. The Daily Herald, "Lovely Lots in Beautiful Ruskin Oaks Subdivision", September 7, 1954. The Ocean Springs News, “Ruskin Oak, Ocean Springs Share Radio Spotlight”, April 10, 1958. The Ocean Springs News, “Sam Dale monument is near completion”, May 31, 1967. The Ocean Springs News, “To dedicate Magnolia Park”, July 5, 1967. The Ocean Springs Record, “Final Moulds For Sam Dale Monument”, October 5, 1967. The Ocean Springs Record, “Dedication postponed”, October 12, 1967. The Ocean Springs Record, “Off the Record”, October 10, 1968. The Ocean Springs Record, “Sam Dale Unveiling Held Last Sunday”, October 17, 1968. The Ocean Springs Record, “Memorial placed at magnificent Ruskin Oak”, April 29, 1971. The Ocean Springs Record, “James Fraser”, January 14, 1988. Jackson Foote, Illinois History, “The Duchess-A Journalism Pioneer”, April 1997.